This is the fifth installment of a five-post series about Dial M for Murder. Alfred Hitchcock's films have a peculiarly enchanted quality. It's a world where an ordinary glass of milk can become a harbinger of death, a portrait painting may stare you down and a statue might perform an interpretive dance. 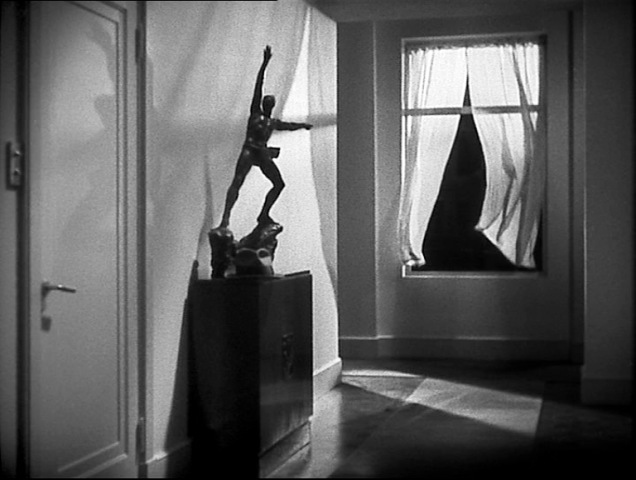 The figurine in Richard Hannay's hallway in The 39 Steps all but sounds the alarm that an intruder has broken in. 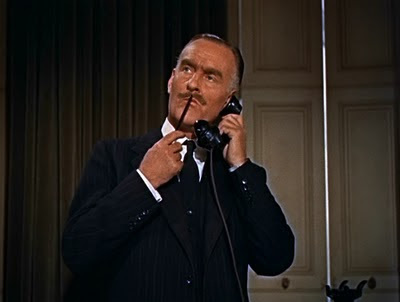 That knack for imbuing ordinary props with extraordinary qualities served him well with Dial M for Murder, whose plot twists depend on such commonplace objects as telephones and keys. In fact, it was almost a necessity. Birds flit through almost every one of Hitchcock's films, always hinting at danger or evil. In this case, thanks to the Asian-themed vases, a bird seems to swoop (kinda sorta) toward Margot as she buckles under the weight of her private guilt and of the false accusations aimed at her. Taken as a whole, the Wendices' art collection runs the gamut between classical and exotic. Tastefully eclectic, it emphasizes Asian art and style, at least with regard to the statuary and furnishings. These pieces, along with a Modern Primitive painting of a church, reinforce the film's transcendent quality, that more is going on than meets the eye or even the mechanics of plot and character. If there is one overarching impression the set makes, it's that the Wendices are people of taste. Coffee table books about Da Vinci, Bellini and the French Impressionists lie casually about. Their well-appointed liquor stock ranges from special occasion brandy to "an indifferent Port." As in many Hitchcock movies, especially the tennis-themed Strangers on a Train of which Dial M could almost be a sequel, doubles abound. There are the two jade lamps, two Wedgewood vases and a photo of Tony holding a pair of tennis rackets. Though it didn't make the final design, Hitch's notes also called for objects on the mantlepiece to be "visually doubled in number by the wall mirror behind them." There is the ornate pair of wooden chairs that resemble the chairs Johnnie gave to Lina in Suspicion. Tony's repeated whipping-shut of the curtains -- an apparent continuity error (or is it? ), for he actually shut them twice -- and the repeated high-angle shots tracing and retracing the steps of the crime all add to the film's uncanny atmosphere that, as Freud wrote, "forces upon us the idea of something fateful and inescapable when otherwise we should have spoken only of 'chance.'" This is of a piece with the film's 3D experience itself, which Hitch used to help conjure up the feeling that the audience had been mystically transported into the film. That sensation was reinforced by Asian or Asian-inspired furnishings and other touches hinting at Eastern mysticism. It even finds its way into the dialogue, as Margot and Tony reminisce about their experiences with the Maharaja in India. There's one piece in particular that merits special attention. But first, I need to set the stage. One of Dial M's primary themes has to do with watchfulness. Tony, as the mastermind behind the murder plot, must remain on the alert and on his toes throughout the movie. Yet, he is superseded by even more alert watchmen. Watchmen abound in this film, which opens with a view of a cop stationed right outside the couple's home. 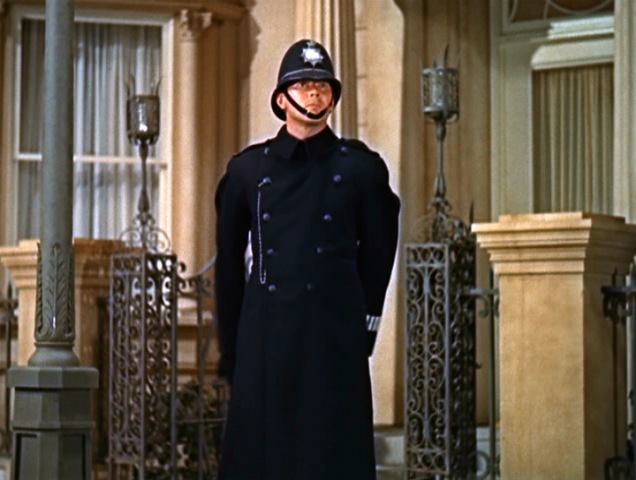 Nothing gets by Chief Inspector Hubbard (John Williams, in a reprise of his role on Broadway). 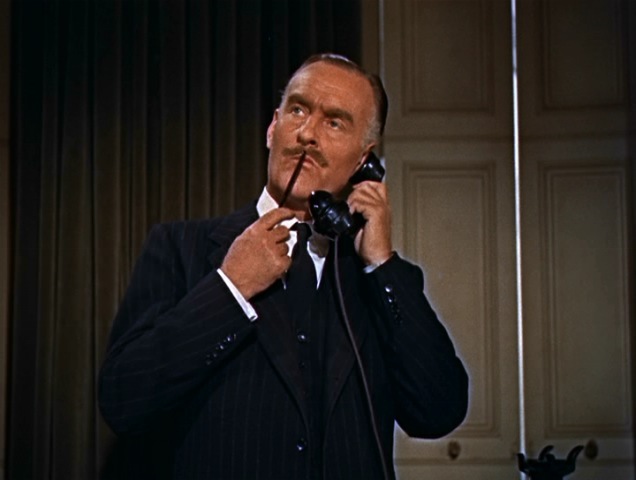 As a bookend to the opening shot, Dial M for Murder closes with one last look at the film's Chief Observer. Tony acted in secret -- or so he thought. But there was, it can be said, a watchman right inside his home, carefully hand picked by the director himself. This figurine of a Chinese woman stands like an inscrutable sentinel, a partner in vigilance with the English Bobby that patrols the street outside their home. She appears in dozens of shots, from every angle. In what may be another continuity error, but which is creepy nonetheless, the statuette seems to turn its head to follow the action, facing the audience head-on. I believe this is deliberate: from Blackmail to Psycho, Hitch's artwork often looks straight into the camera, to uncanny fourth-wall-breaking effect. Even more interestingly, this supposed "error" actually happens twice in the movie. Vigilance is the key to stopping the Tony Wendices of this world from getting out of hand. Luckily, there are those who, like the inspector, are willing to work above the rules (“Highly irregular, I know!”) in order to serve justice. Ironically, the film's closing lines are delivered by the villain, who is mixing cocktails: “I suppose you're still on duty, inspector?” – a nod, not only to Chief Inspector Hubbard of the film, but to an eternal Inspector whose justice always prevails in the long run. Hitch also acquired one valuable prize from the film: this was his first venture with Grace Kelly, whom he subsequently transformed into a movie star in Rear Window and To Catch a Thief, before she was scooped into the clouds and rechristened Princess Grace of Monaco. Sadly, under circumstances eerily reminiscent of scenes from the latter film, in 1982 she died in a car accident on the cliffside roads above Monte Carlo. I've been searching for her ever since. I don't know if this is the place to discuss, but there's an aspect of Dial M which has never sat well with me; I can't figure it out. It is: when the police find/examine the stocking which had been around Margot's neck, they come to the conclusion it was Margot's because "the heel had been darned with silk thread which didn't quite match the stocking" and they subsequently said to Margot "you have a reel of that exact same silk in your work basket". What I don't understand is, from a story-telling point of view, what does it matter if the silk matched the stocking or not? The incriminating evidence is that Margot possessed a reel of silk which matched that which had been used to darn the stocking. The fact that she didn't have the correct colour, or couldn't be bothered matching the colour is irrelevant. Dare I say it, but... to me, this element of the story seems badly written. Or, is it simply reflecting reality where sometimes we make mention of pointless details unnecessarily? Or, alternatively, was it a 'dig' at the awkwardedness of male police/detectives when dealing with things feminine? It's the only part of Dial M which irritates me. Other than that I will never get over the excellent-ness of a pair of dressmaking scissors being used as a murder weapon!! The fact that the scissors are a feminine household tool and that Lesgate inadvertantly drove them into his back further by falling on them, is worryingly wonderful. Hmmmm... Interesting question. My opinion is that Chief Inspector Hubbard was merely commenting that the htread stood out in contrast with the rest of the sock. A detail that would be hard to overlook. As such, it likelt appeared to the police as a possible clue to the origin of the stocking (similar to the bits of mud on Lesgate's shoe that matched that on the floor mat. This film is all about the details, where God or the Devil are both said to reside. So, while you're correct (I think) that it didn't matter whether the thread matched or not, I think the idea was to bring yet another detail into focus, and to demonstrate Hubbard's hyperawareness of such details. Yes! That knife driving deeper into Lesgate's back gives me the heeby jeebies every time. Interesting points and insight into Hitchcock, whom I'm becoming more and more fascinated about, the more I read. What reeeally bugs me is why Margot, a verry wealthy woman, would be mending her own silk stockings, anyway. She didn't even do her own cleaning--had a "charwoman come in one a week." The price of the Asian figurines and celadon lamps alone would keep me in the money for weeks, especially the famille jaune lamp on the desk!